The James Riverkeeper, a genial, burly guy named Lynn Ridley, was waiting in the terminal when I arrived. The mission was to inspect and photograph three sites on the James that, according to boaters, had been discharging silt and other unpleasant things into the river. We had been worried about the weather, as a cold front had been approaching but it turned out to be clear, with broken clouds at 3000 feet. We flew first to the Federal Prison near Hopewell. Lynn wasn't sure what to expect there, but immediately spotted a place where the bank was eroded by runoff, although there was no sign of any runoff today. I flew right-hand circles around the prison at 800 feet while Lynn photographed the eroded area. Then we flew northeast a few miles to a DuPont facility. I saw no sign of runoff there, either, but Lynn was able to spot the now-dry source of it, and I circled again while he photographed. The tricky part came next. Lynn's third site was the new bridge being built across the river for Interstate 895. This location is inside the outer circle of Richmond International's airspace. Because we would be staying low, we would technically be outside the Class C airspace, which begins at 1400 feet there. All the same, I thought it prudent to let Richmond Approach know what we had in mind, so I called them up. The controller gave my a squawk code and said to call again when we were over the photo site. That was easy enough. We flew right upstream--due north just there--until the new bridge came in sight. What didn't come in sight at first were the five towers shown on the sectional chart. We never did spot two of them, but the others were there, and I flew right past one of them every time we circled the bridge. According to the chart and the altimeter we were higher--but it didn't look like it to me. From there we left Richmond's airspace and decided to inspect a fourth site. 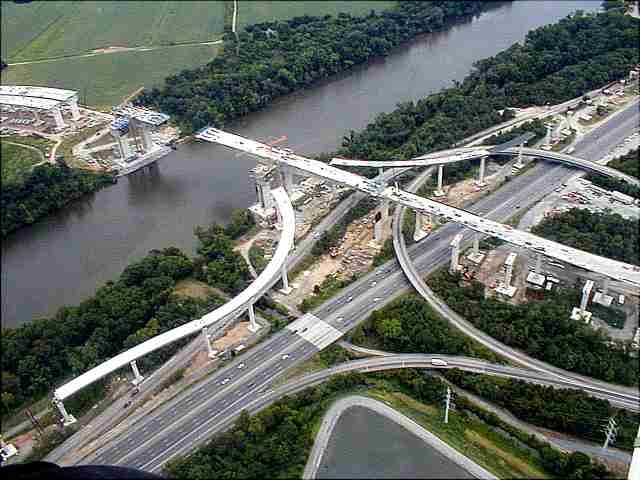 We flew northwest to the place on the James west of the city where the new Route 288 bridge is about to be built. There was no visible runoff there, either. They seemed to be doing things right--had a floating dam in the water to catch any runoff--but Lynn said that the hill is quite steep and in a heavy rain the bare earth will just wash right into the river. That was it. We flew back to the airport, landed, and called it a day. It was a very pleasant day for me. I had a good excuse to fly low, and I got to spend an hour in the air with Lynn Ridley, the James Riverkeeper.